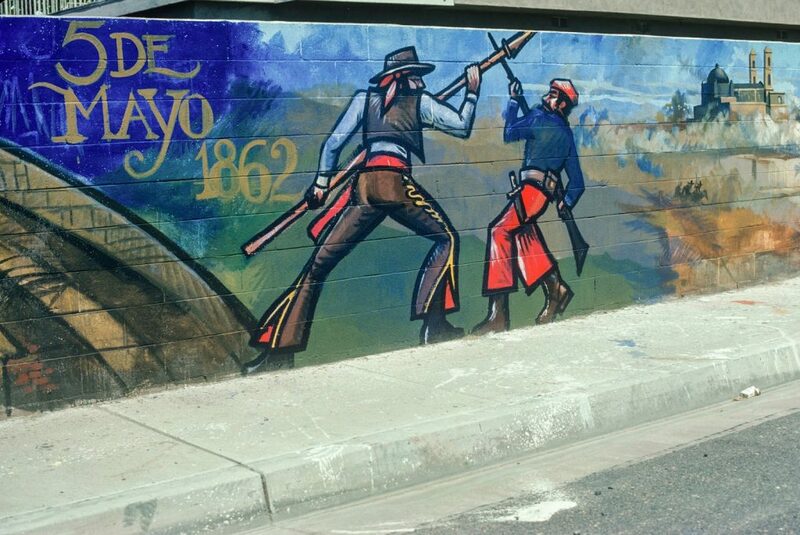 Cinco de Mayo: Two Wars, Two Nations, and a Holiday with California Origins – ¡Murales Rebeldes! Mural detail, Battle of Puebla, May 5, 1862, Sergio O’Cadiz Moctezuma, Fountain Valley Mural (1974–76). Copyright © O’Cadiz Family Private Collection. 155 years ago years today, on May 5, 1862, an assault was waged by French soldiers against Mexico. Its outcome was decided when Mexican troops victoriously defended their country. The Battle of Pueblo, an early battle of the 6-year-long French-Mexican War, helped transform a country divided by regional interests into one united against foreign intervention. It was a David-and-Goliath story: 2,000 Mexican soldiers prevailing against 6,000 well-provisioned troops of the world’s most powerful and largest army. 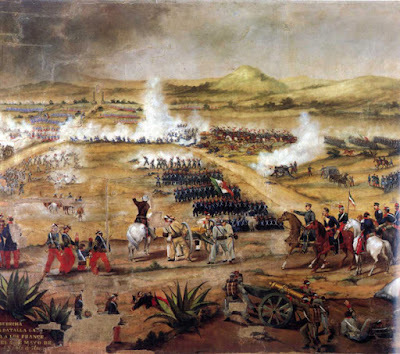 The battle began at daybreak, and when it concluded with the French in retreat, only 100 Mexican soldiers had been killed, compared to nearly 500 enemy forces. Battle of May 5, 1862. Museo Nacional de la Intervenciones, Ex Convento de Churubusco, INAH. However, these celebrations were not just for the Mexican homeland. 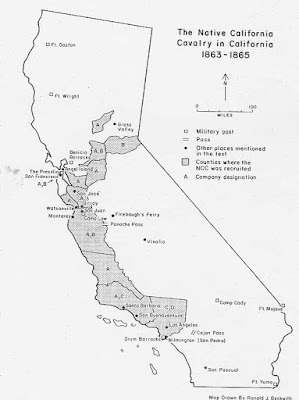 The United States itself was engaged in Civil War, and Latinos sought to preserve California’s status as a “free state,” particularly as Confederate soldiers advanced into New Mexico and Arizona. “When Latinos here got the news that French were stopped at Puebla, it electrified the population, and propelled them to a new level of civic participation. Latinos joined the Union army and navy and some went back to Mexico to fight the French,” Hayes-Bautista explained in an interview. Daniel Greene, Romualdo Pacheco, 2005. Collection of the U.S. House of Representatives. Many Mexican Americans in California (called Native Californians during that era) joined volunteer units of the Union Army. 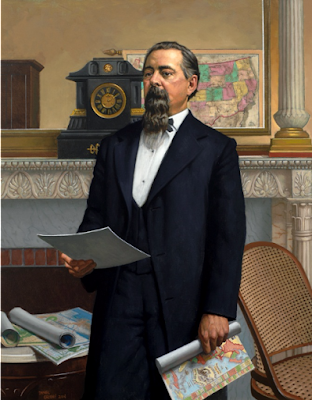 In 1863, Governor Leland Stanford commissioned Romualdo Pacheco—who later became California’s twelfth governor, the only Hispanic to serve in that position to date—as a brigadier general in the California state militia. 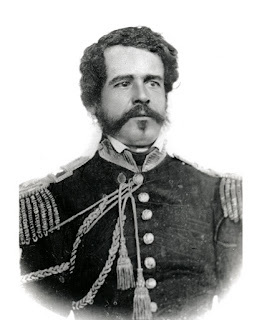 Pacheco commanded Hispanic troops in the First Brigade of the Native Cavalry of the California Volunteers. 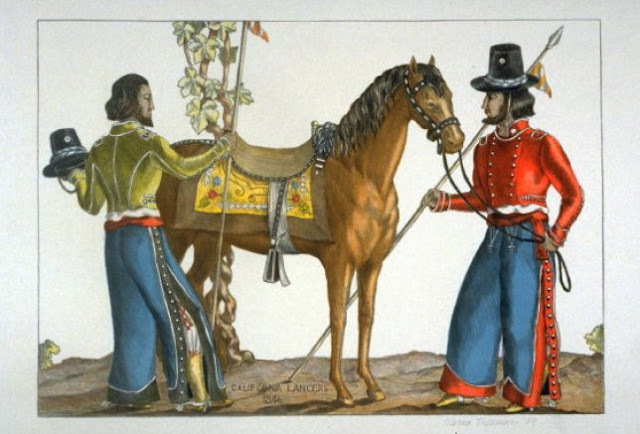 As cavalry recruits, these Californios from the state’s vast ranchos were expert horsemen, skilled as lancers, and experienced in the field. Captain Antonio Maria de la Guerra, Company C, First Battalion, Native California Cavalry. Courtesy www.findagrave.com. The Native California Cavalry in California, 1863–1865. Courtesy www.militarymuseum.org. 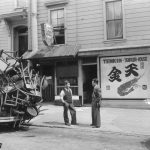 With its origins in 1860s California, Cinco de Mayo was rediscovered 100 years later. 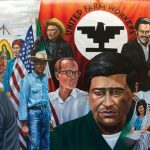 During the Chicano Movement of the 1960s and 1970s, Mexican Americans across the nation—primarily in the Southwest—protested inequalities for U.S. Latinos. 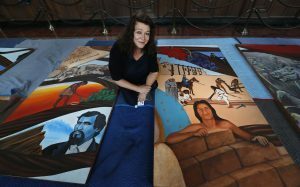 Chicana/Chicano muralists also took to the streets, embedding their expressions of cultural pride, their heritage, and their challenges to the status quo on the walls of city buildings, housing projects, and other community structures. 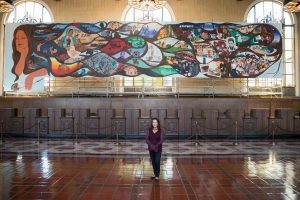 Though many are no longer visible, to this day Chicana/o murals remain an integral part of self-expression, Chicana/Chicano culture and heritage, and a significant contribution to the historical record. Mural detail, Cinco de Mayo, May 5, 1976, Sergio O’Cadiz Moctezuma, Fountain Valley Mural, 1974–76. Copyright © O’Cadiz Family Private Collection. 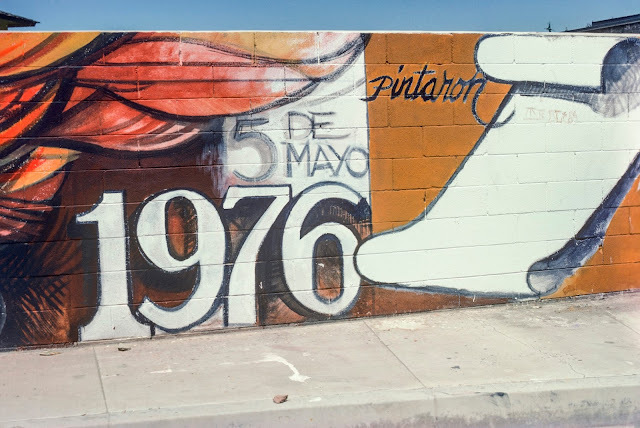 An example is the sequence of 25 scenes that comprise Sergio O’Cadiz Moctezuma’s Fountain Valley Mural, painted in the Colonia Juarez neighborhood from 1974 to 1976 but destroyed in 2009. Beginning with the arrival of Mexican peasants in California when Orange County was still farmland, the mural’s narrative jumps into the future to the Chicano Movement, and then goes back in time to tell the history of modern Mexico. With the mural’s replacement by a bland block wall, a significant part of Colonia Juarez’s unique and colorful history was lost.